This is a piece of poetry about childhood. We think it is based on a boy Wordsworth knew called William Raincock who was well known as an owl-mimic. Wordsworth went to school with him and later followed him to Cambridge. However, in the earliest version, which you will be looking at here, Wordsworth writes as if he is the boy calling to the owls. In later drafts he describes the event in the third person. [The lines] I should have recognised any where; and had I met these lines running wild in the deserts of Arabia, I should have instantly screamed out "Wordsworth!" (STCL I, 453). 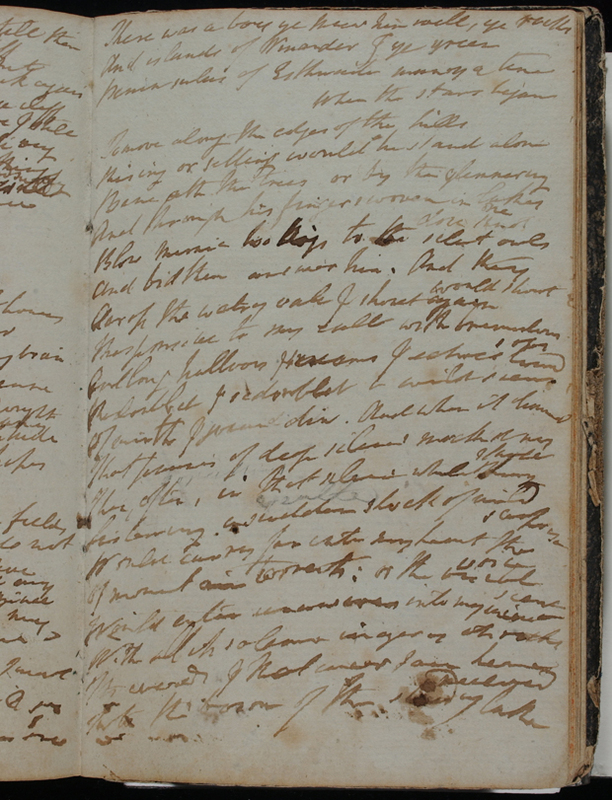 The extract comes from the earliest manuscript (MS JJ) of Wordsworth’s autobiographical poem The Prelude. Ask the class to work in pairs and give each pair a copy of the extract (A3 if possible). Ask the class, in their pairs, to examine the extract, making notes on their sheet and looking particularly at anything to do with echoes and sound. Go round each pair and ask for one thing they discovered. Discuss as a group. Fill in anything they’ve missed. - Views on childhood – this poem incorporated into a section of his autobiographical poem, The Prelude in which he outlines his views on childhood and education. He passionately believes that children should be encouraged to be imaginative and creative and to have a sense of wonder at the world, as opposed to being ‘rationally’ educated, as it was called at the time, where the emphasis was on acquiring knowledge and facts and figures. Follow Up Activity: "Spots of Time"
This extract is what Wordsworth describes, later in his autobiographical poem The Prelude, as a "spot of time". A "spot of time" for Wordsworth is a memory that remains important many years after the event. It is held in the mind from a time when, as a child we do not yet have a clear chronological sense of time. As a result these moments have a peculiar power for us later as adults. Ask the children to write a poem or piece of prose about one of their own spots of time. It always works well to ask them to write about their earliest memory first and then why they think they remember it. You can point out to them that the memory is often apparently arbitrary and insignificant. Nonetheless it becomes an important part of our self-identity. Into the bosom of the steady lake . . . The word "shout" is normally one we would associate with the human voice. It also provides a contrast with the silent owls of the previous line. Wordsworth uses repetition here so that his language reflects the repeated calls of the owls, and their echoing around the landscape. A list of the variation of sounds that the owls make. Wordsworth places all the sounds close together to intensify the noise. Again, Wordsworth uses repetition here, reflecting the "echoes" of the previous line: sound is all around him. "Mirth" and "jocund" are both words meaning "happiness" and "happy", so although Wordsworth does not repeat the same word, as he has elsewhere in the extract, it is a repetition of ideas. Similarly the word "din" suggests the volume of sound, as do some of the words used in the previous lines. Where the first part of the extract is full of sound, the second part is, by contrast, full of "silence". It is perhaps the sudden lack of sound that makes the silence "deep". Another repetition: Wordsworth wants to emphasize the lack of sound here just as much as the amount of sound earlier. The physical act of ‘listening’ is important to the whole passage, but here, in particular, it leads to the almost out-of-body experience at the end of the poem. 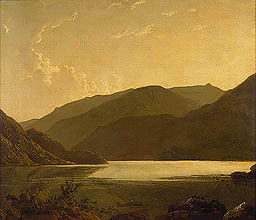 As with the owls earlier, Wordsworth uses a word more usually associated with human speech to describe the sound of the landscape. Wordsworth now realizes that in listening for the sounds of the owls, he has opened up his senses to absorb the impressions of the landscape. Where before there was ‘silence’ he can now hear and see the world much more clearly.